F14 will be here soon! I used to watch VF-1 Tomcats fly over my house all the time when I was little. I still remember the rumble in my chest when they blasted across the sky. And if you haven't seen "Final Countdown," well...you're missing out. Last edited by TNT; October 16, 2018 at 12:00 AM..
Was always a pretty bird with the swept wing design. Let me know if you ever want to get into it. Steep learning curve, but I've helped a few friends learn the basics. The base game is free, comes with a P-51 trainer and Su-25T Frogfoot (Russian ground attack aircraft). The rest of the aircraft are $$$, but well worth it. The biggest cost is the hardware. I've already invested in HOTAS, rudder pedals, MFCD screens. I'm currently working on designs for a full sim pit, with functional switches, dials, etc. 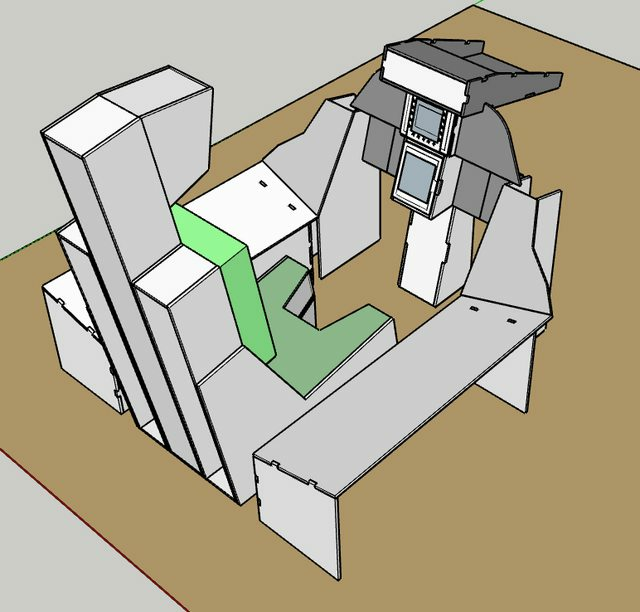 Fortunately, another enthusiast did the full cockpit design in sketchup, and I have just been picking apart his artwork and modifying it for manufacturing with 3/8" plywood. Adding joints, rearranging, and the like. Still has taken me the better part of a week to get this far. The F-14 is the reason I wanted to join the Navy. Already long gone by the time I did, but I've always been interested in aviation. I think when the kids are all grown up, I'll go work on a private pilot's license, then get taildragger qual'd, and maybe, maybe one day get some time in a Bf-109 or an F4U. Both of those planes would be bucket list type aircraft for me. Though I'm sure I'd love flying a Citabria or something of the like on the regular if I could. Last edited by TNT; October 16, 2018 at 07:44 PM.. If memory serves he was a huge (pun intended) flight sim fan. To the extent that he built an at least thousand dollar plus in-home flight sim rig. Not too long ago he picked up a general aviation license so he may be into the real thing more than sims now. Yep, I was right. His sim stuff is probably in this thread somewhere. Yeah, I remember following that thread. I'm jealous of his real airplane time. I have to stick it out as a keyboard commando for quite some time until I can justify the cost. Getting the license isn't that expensive, but maintaining proficiency is a lot of time and money. That looks awesome. I'll have to check it out when I have some time this winter. For anyone looking to make a cheap-o setup, I got a USB connector for my Xbox360 driving wheel & pedals so I could use the former in X-Plane. Not a great simulation for opposing rudder pedals, but sure beats the joystick rudder control I used before. Amazing, I do like simulators and will definitely let you know if I get into the game. I had the opportunity to fly an older (1970s) Cessna, pretty incredible experience. The guy I was with had me do all the pre-flight checks, and then let me taxi, takeoff, fly and land... Takeoff was a bit terrifying, watching the treeline approach the windshield, pulling the stick back and feeling like the wings were barely missing the treetops.